January | 2013 | "A Stitch in Time"
NOTE: a more mature content book! 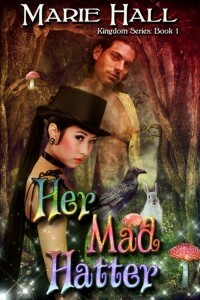 With one, really one and a half, explicit sexual scenes in this paranormal-fantasy romance Her Mad Hatter by Marie Hall is a little out of my usual realm of romantic stories. BUT before you write it off for a chapter and a few pages towards the end I am actually suggesting this as a good fantasy ADULT read. With more than a taste of Wonderland and the Mad Hatter our Alice Hu is in for an adventure. This Hawaiian born cupcake baker has been infatuated with the story of the original Alice and since the age of 13 and her dramatic recovery from brain cancer, in love with the Mad Hatter (even more so after the new Johnny Depp). With a fairy godmother who is in charge of the “naughty” boys of the fantasy realm ( the bad 5 in fact who include the Wolf from Little Red Riding Hood and Hook of all people!) there are romances to be started. After all, who is more interesting than a bad boy? Given a year to match up her 5 boys Danika has her work cut out for her, but the chance meeting of Alice has her focused on the Mad Hatter. Alice Hu is the great-granddaughter of another Alice Hu, one she resembles almost perfectly… though she cannot like her. She is not like other women, infatuated with a story… in love with a character and a survivor of an extreme form of cancer. Found by Danika she is given 3 days in Wonderland to be the woman the Mad Hatter needs. Now there are a few twists and some amazing images to imagine. I don’t want to give away too much but would suggest that you pick up this book as long as you can handle the sexual content… the main character is very frank about how she feels and that is definitely something you have to be ok with. I personally am going to check out book #2 Gerard’s Beauty. Though I will probably do the same as I did with this book and gloss over the scenes containing sexual activity. 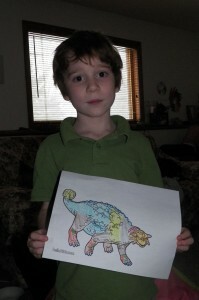 As I have mentioned before Emanuel does love his herbivores… so we moved onto the Ankylosaurus. These armour plated dinosaurs are 4 legged tanks. Club tailed and spike covered, they really are a visual joy for the herbivore loving dinosaur fanatic. 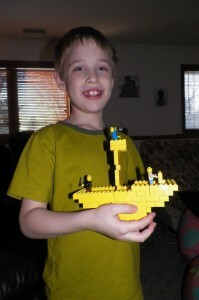 Now let’s get onto our videos…First the ever requested I’m a Dinosaur. Our second video didn’t make the cut with Emanuel, he simply could not sit through it today, BUT it is about dinosaur bones found in the province we used to live in and dealt with the Tyrell Museum (another favourite of the family). That leads us to the links… Found at the end of the Cretaceous period we had a few good links to share with you. Science Kids has some nice images including the skull and bone structure HERE. Kids National Geographic has a short blurb and an image HERE. Discovery Dinosaur Central as a lengthy article with lots of interesting information HERE. 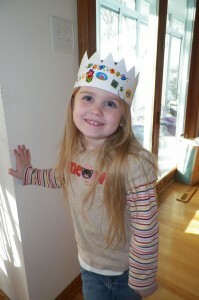 We always love Kidsdinos.com and their charts HERE. Why not check out a site dedicated to the Ankylosaur HERE? Dinosaurs.about.com has a list of the connected dinosaurs HERE. 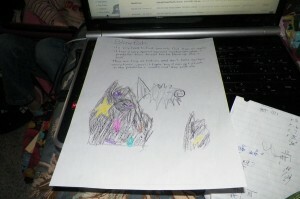 Wiki has an article HERE, and of course there is the colouring page from HelloKids.com HERE. Two more days and the kids are still settling into the routine of Daddy leaving each day and this is him leaving around lunchtime. The following week is going to take further adjustment! But it is a good adjustment. We get creative to fill the time! I think those are zombies and ghosts on there??? So in the meantime I am packing our days with learning… and while the kids are not always on board we are seeing progress in many things. 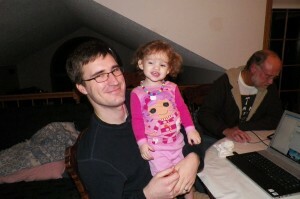 Just need to get science pushed on into our weekly schedule on a more regular basis. 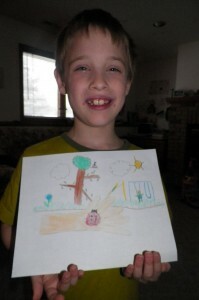 I cannot wait until it is warm enough to order our ants. 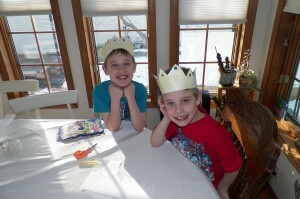 We did get our time in on a special two part Wild Kratts. 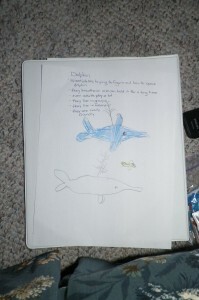 Dolphins AND Blowfish. I think we all learned a bit! 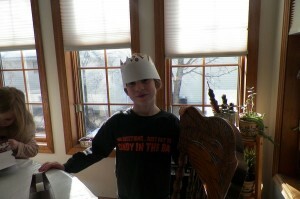 There was some spontaneous paper crafting with all 4 of our big kids… they made crowns! 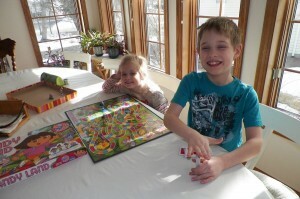 Add in the boardgames and we played our way to education. 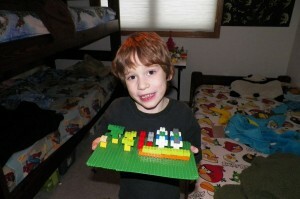 Oh and the progress on Gavin’s Lego hour creation!!! 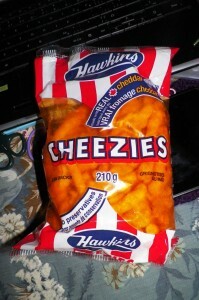 I treated myself to another snack thanks to Karyn – beloved Cheezies… bliss!!!! On Wednesday we celebrated another month of reading… Emanuel got his first pizza coupon for working each day on sounding out and writing out a new word. I am so proud of their progress! 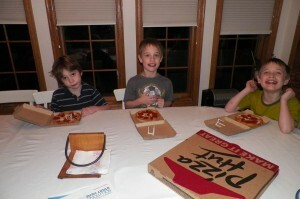 This Pizza Hut sponsored program is great!! But before that lovely dinner we had a few things to accomplish… Starting with a more simplified how to from Art for Kids – a ladybug, note Zander’s hand holding his! 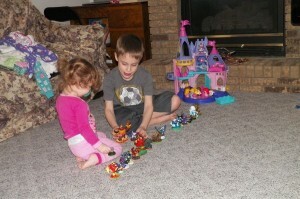 Gavin spent some quality time with his baby sister playing HER version of Skylanders… some sort of weird noised back and forth with various figures that would then end up in the line again! 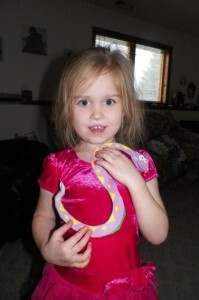 And then there is our scissors practice – Trinity is getting rather pro with her S snake from Activity Village!! 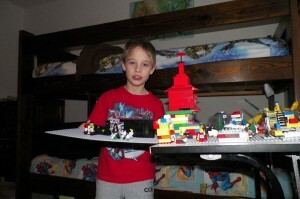 And to round off our creativity Zander made a rather amazing sailing pirate ship out of Legos! 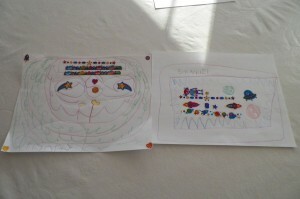 It feels good to see them independently create a little more! And to see some passion in our work.